The following versions of the Elitebook also are affected and can use the same BIOS. 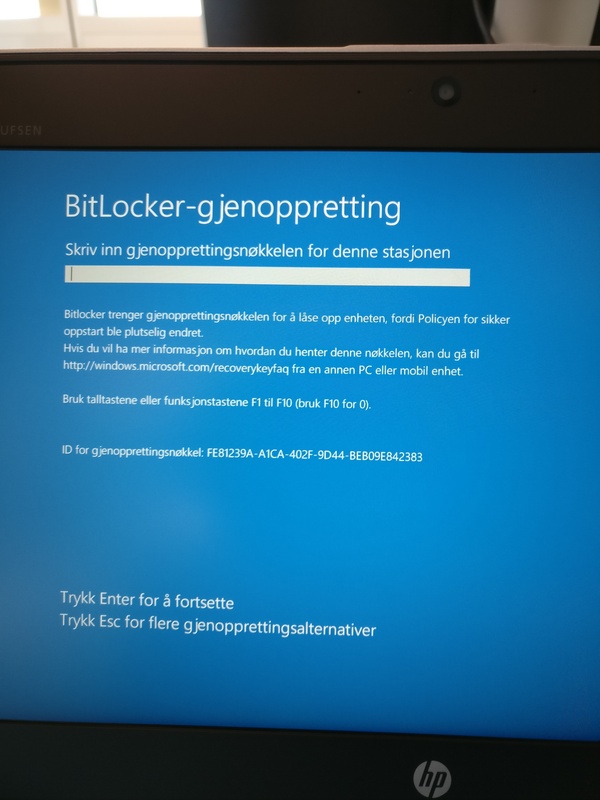 Earlier today I stumble upon an issue with the HP model Elitebook 820 G4 and bitlocker where during the startup it asked for BitLocker recovery key for no apparent reason. You could either input the bitlocker key and continue or just press ESC 3 times until you got in to BIOS and just press continue and the machine would continue without having to input any recovery key. and so on, there was nothing wrong with the configuration. Still there was issues that not all the time but the majority of restarts the computer kept on asking for the bitlocker recovery key. What I’ve found out was that the Firmware version 01.05 caused the issue. If you are running 01.03 you shouldn’t have this issue and on HP support site they just released a new version 01.06 so I updated and the problem was solved, no more bitlocker recovery key question during startup. Thats all for now and Until next time, cheers ! We are seeing the similar issue on Lenovo X270 but with Legacy Bios and Windows 7 TPM 1.2. We upgraded the BIOS to the latest version, but for no reason it keeps prompting the Recovery key. Has it failed as long as you have had that model? Or when did you start seeing this issue ? We had same problem on multiple modles with Legacy+TPM 1.2. Try to change boot order, move hdd boot all the way to the top and USB-HDD boot to the bottom. Somehow the computer thought that USB-mouse was some kind of booting device and it caused the BitLocker prompts.